Are you thinking about becoming a vegan? Already a practicing vegan? More than 3 million Americans currently live a vegan lifestyle, and that number is growing. Living Vegan For Dummies is your one-stop resource for understanding vegan practices, sharing them with your friends and loved ones, and maintaining a vegan way of life. This friendly, practical guide explains the types of products that vegans abstain from eating and consuming, and provides healthy and animal-free options. You'll see how to create a balanced, nutritious vegan diet; read food and product labels to determine animal-derived product content; and stock a vegan pantry. You'll also get 40 great-tasting recipes to expand your cooking repertoire. 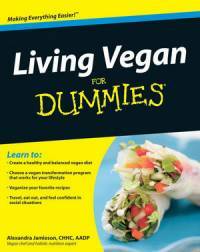 With the tips and advice in Living Vegan For Dummies, you can truly live and enjoy a vegan way of life! Alexandra Jamieson, CHHC, AADP, is a professionaly trained vegan chef and board-certified holistic health counselor. She has appeared on Oprah, The Final Word, 30 Days, and The National Health Test with Bryant Gumbel. She was also featured in the Oscar-nominated documentary Super Size Me.